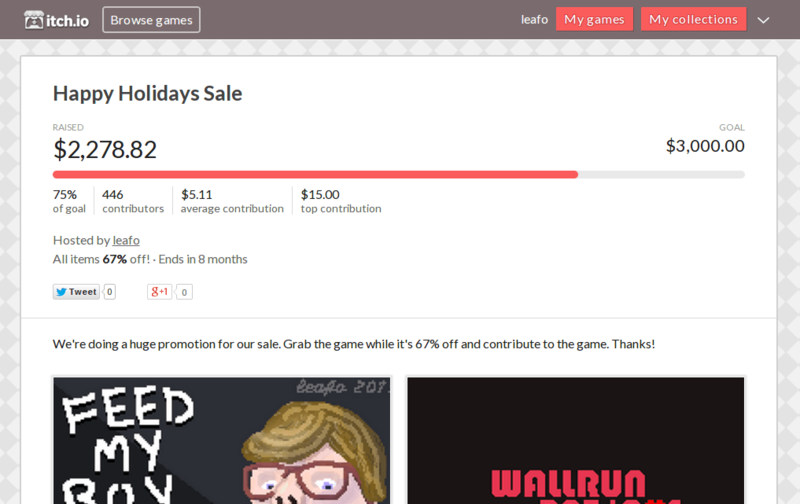 You may have seen that the Devs With Ferguson Bundle, which raised over $11,000 for the Ferguson Public Library, had an interesting banner on the top of the page with some public data about how much the bundle has earned along with some data about the kinds of contributions it had received. You can now use the same banner on your own projects. This is done by setting a monetary goal on your entire sale. When you set a goal, the money earned during the period of the sale is made public on the top of each game page and on the sale’s main page. Any potential buyers can see what your goal is, how much time is left, and a summary about how others have contributed. A progress bar is also provided, showing how far along you are in the goal. P.S. When the sale is over the banner is removed from the game pages but remains on the sale’s main page. Since launching sales, one of the biggest requested features have been better analytics for sales. There’s now a brand new page with detailed analytics for sale purchases along with some numbers about how much the sale has earned. 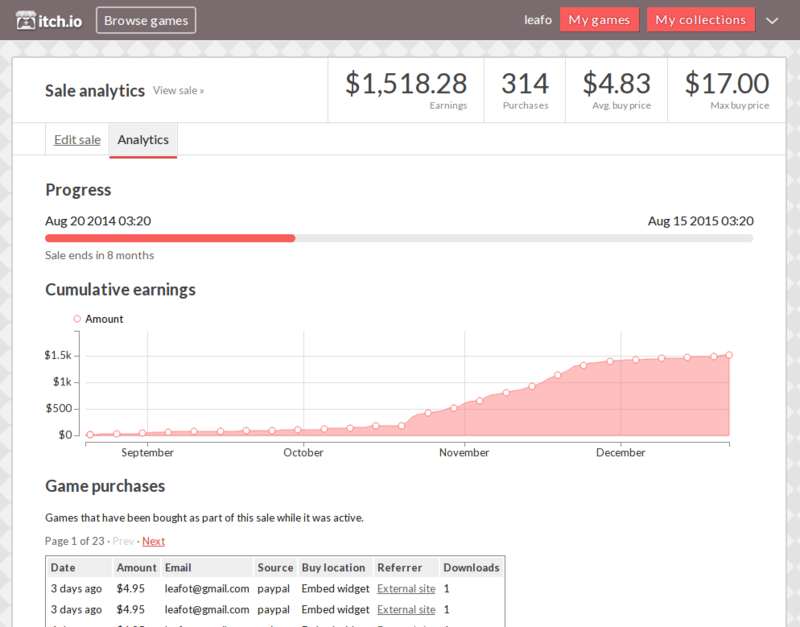 On the sale analytics page you’ll find a few different things. There’s a progress bar visualization of how much time is left in the sale. Both game and bundle (if applicable) purchases are browsable with the standard buyer information and referrer data. If your sale has any purchases a chart of cumulative earnings is displayed that shows how much you’ve earned in total over the duration of the sale. On the the top of the page is a quick overview of the earnings along with average and max purchase prices. You can find the link to the sale analytics page next to the sale’s edit button in the sale toolbar.